Summer Moon are a supergroup of sorts, fronted by former Strokes bassist Nikolai Fraiture, with Stephen Perkins of Jane’s Addiction on drums, Camila Grey of Uh Huh Her on keys and backing vocals and Noah Harmon of The Airborne Toxic Event on guitar. Initially the line up included Erika Spring of Au Revoir Simone and Tennessee Thomas of The Like, who feature on early release ‘With You Tonight’. Discussing the birth of the band Nikolai comes across as one of the most nonchalant musicians we’ve ever spoken to. If endearingly aloof was a character portrait, Fraiture fits perfectly. 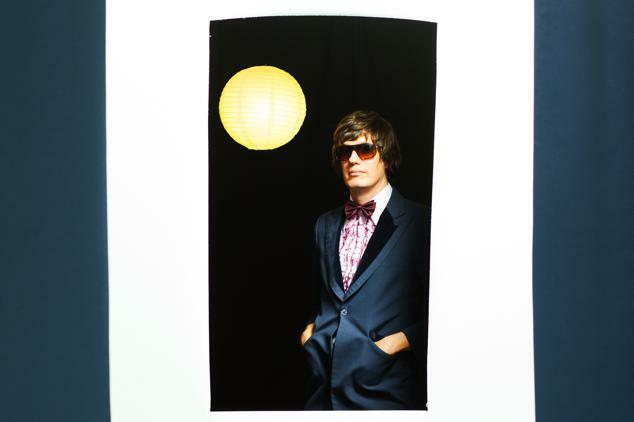 As The Strokes began to wound down, Nikolai’s other work began to take a clearer, polished shape (that which would become Summer Moon): “I used to sit in my apartment in New York and just play guitar, write new songs and invite friends over to come and play” he says in a superbly low key drawl. He appears to be one of those musicians so deeply focused on writing music and playing guitar that an expansive conversation on the birth of the band are irrelevant. He might as well live by the mantra let the music do the talking. ‘With You Tonight’ has a laid back, summery charm to it and the feeling is that this comes from not having pressure of working under the pressure of studio deadlines out of his control. Playing most of the music himself alleviated any need to be diplomatic as well as submissive to the strains of mega labels and publishers. As a result, listening to ‘With You Tonight’ Fraiture’s experimental side comes across loud and clear on tracks such as ‘Car vs Bldg’ and ‘Into The Sun’ moving in a distinctly breezy and dance-y direction. It is a sound rarely heard in his Strokes days. We asked him if he saw this coming at any point, and whether he sees Summer Moon going beyond one release: “I have and will always be writing music in some format or other, so it’s hard to say whether I saw it coming. As for the future of Summer Moon, I’m already writing new music”. We should have guessed. Talking to Nikolai, his attitude towards Summer Moon would seem alarmingly relaxed to a lot of people, but there is a subtle tone in his answers that suggests he knows exactly what he is doing, and truth be told, the resulting songs work. We asked about the dynamic of the band and how they work together and Fraiture and his answer is, as is becoming the norm, straight up: “We’re just experienced musicians in our own right, and excited about doing something new and creative”. There are undeniably Strokes tropes to the album, not something easily shed after 15 years of music making with one set of musicians. However that is no bad thing. Listening to 'With You Tonight' it is apparent Fraiture has to some degree shifted away from the sound we all know him for, into new unexplored territory. Nikolai seemed quiet, almost reticent to promote the album during our chat. Perhaps, as we already said, it’s best to let the music do the talking on this occasion - it won’t let you down. Summer Moon's debut album 'With You Tonight' is out now.